The graph pictured above and published to accompany a Financial Times article entitled Advantages of Frugal Fuel on November 5th 2009 is well worth studying in detail. 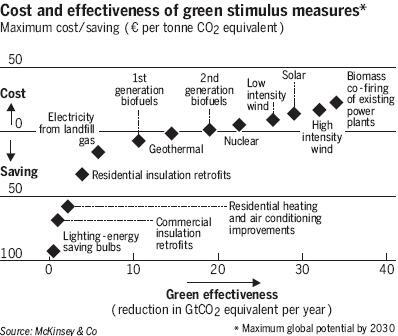 It shows the relationship between the financial costs of various ‘green stimulus measures‘, and the total reduction in carbon emissions they could lead to per year. Any measure undertaken which lies between the horizontally cost/saving 0 line on the graph will actually save money – i.e. by spending money on energy efficient light bulbs, and insulation in particular, not only are levels of carbon emissions reduced, but you make back more money than you initially laid out. It makes no sense to invest billions of pounds on new coal, gas, and nuclear power stations, when that money would better be spent reducing our power needs simply by improving energy efficiency. 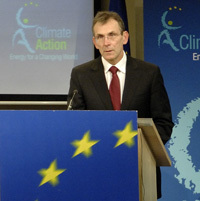 The European Commissioner in charge of Energy Andris Piebalgs says “Energy efficiency is the cheapest and most effective way to reduce energy policy risks“. With the EU importing the majority of the fuel it uses, member states are at risk of supply failure. By reducing overall consumption, the risk of failure is diminished. Also, by increasing energy efficiency, people have more disposable income to spend on goods and services, and EU manufacturing and industry is more competitive. Retrofitting insulation, low E glass, CFL and LED lighting etc could result in two million new jobs in the EU over the next decade and a 25 Billion Euro return on an 8 Billion Euro investment!